Published: March 2018 - Fiewel and Friends. Source: Thank you so much to Jonathan Ball Publishers for sending me this book in exchange for an honest review. Princess Lira is siren royalty and the most lethal of them all. With the hearts of seventeen princes in her collection, she is revered across the sea. Until a twist of fate forces her to kill one of her own. To punish her daughter, the Sea Queen transforms Lira into the one thing they loathe most—a human. Robbed of her song, Lira has until the winter solstice to deliver Prince Elian’s heart to the Sea Queen or remain a human forever. The ocean is the only place Prince Elian calls home, even though he is heir to the most powerful kingdom in the world. Hunting sirens is more than an unsavory hobby—it’s his calling. When he rescues a drowning woman in the ocean, she’s more than what she appears. She promises to help him find the key to destroying all of sirenkind for good—But can he trust her? And just how many deals will Elian have to barter to eliminate mankind’s greatest enemy? I needed this book as soon as I heard "retelling" and "pirates". 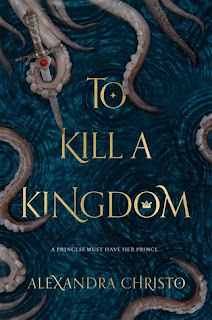 Considering that what was my most highly anticipated pirate book, Daughter of the Pirate King, ended up being disappointing and problematic, I was ready for something else. This book met my expectations full on. Christo's writing grew on me. I don't love it, but for a debut I think it's above average. There is an unfortunate amount of info dumping in certain places throughout the story, but otherwise the writing is good. Christo's a strong writer. She also writes insanely brilliant dialogue - the perfect mix of wit, information, and character personality. And the banter is sublime. The descriptions are spellbindingly lush. The story is so atmospheric, and every scene is chillingly and deliciously palpable. I particularly love all the underwater scenes because of how Christo brings them to life. They're vivid and creepy, and the final climax takes that above and beyond. The imagery is just captivating. The plot is exciting and entertaining, and the action is breathless and dark. The rich mythology coursing throughout the tale is also stunning. It really brings magic to the world Christo's created. Speaking of, the world building is amazing. The depth and the imagination, the fairy tale landscapes and cold waters and haunting seaside towns and brawling taverns all sweep you into their grasp. I love that the characters visit many different lands (islands) on their journey, because as the reader you get to experience a whole array of diverse, magical settings. I do have some very minor issues re. the plot (they're basically just parts of the story I'd appreciate clarity on), and so I'm just gonna list them below. They're just small things I think the author should've taken the time to explain in the story. - When Elian saves Lira and brings her on board his ship, she's naked. So he kindly gives her his shirt to wear. Now while that's all very well, his shirt would not have covered her completely, and considering she moved around a lot, surely she needed to be wearing something on the bottom half of her body as well?! What's up with that - couldn't they have given her pants too? Or if they did, why are we, the readers, never told? And if they didn't, why don't the other characters react to seeing *cough* *cough* what they would naturally see if she wasn't wearing pants? - Lira first plans to attack Elian when she sees him alone on his ship in the harbour. But considering that the chapter right before that (in Elian's pov) had him wandering around the library in the castle, a jump to him randomly showing up on his boat seems very sudden and coincidental. - Lira and a mermaid fight over Elian in the water towards the start of the book. He's unconscious for most of it, but then he washes up on the sand and Lira makes a move to kill him (before she's scared away by his guards). Elian is conscious for this. Later, he saves Lira when she's been turned into a human, and he doesn't recognise her. Surely, even though she's human and not siren, he would've recognised her? She couldn't have looked that different. His hand moves from beside mine, and I feel a sudden absence. And then it's on my cheek, cupping my face, thumb stroking my lip. It feels like the worst thing I've ever done and the best thing I could ever do and how strange that the two are suddenly the same. The characters are a mix of lovable cinnamon rolls and adorable dark darlings. Basically, they're epic. Lira is a wonderfully fierce, vicious heroine who gets excellent development, and Elian is the perfectly swoony and dashing anti-prince. The rest of his crew are an amazing bunch of people, too, and they're all well developed, strong personalities. I love them all so much. Even the Sea Witch, a deliciously dark villain, is the kind of character who brightens up every scene just because she's so creepy and vivid. I adore the scenes between her and Lira. The relationships in this book are brilliantly written. The romance between Lira and Elian is extremely slow-burn, but their banter is fantastic and the development of their relationship is so well paced. The friendships between Elian and his crew and the friendship between Lira and her cousin Kahlia are also amazing - I love how close Elian's crew is, how Kye and Elian have this gorgeous bromance, and how the banter between the group is so spot-on. There are so many good friendships in this story. To Kill A Kingdom is the YA pirate fantasy we've been waiting for. Be prepared to be swept away into dark, chilling waters amid a cast of fantastic characters, swoony romance, and epic banter. It's a swashbuckling, seductive adventure. Female Film Reboots: Yay or Nay?